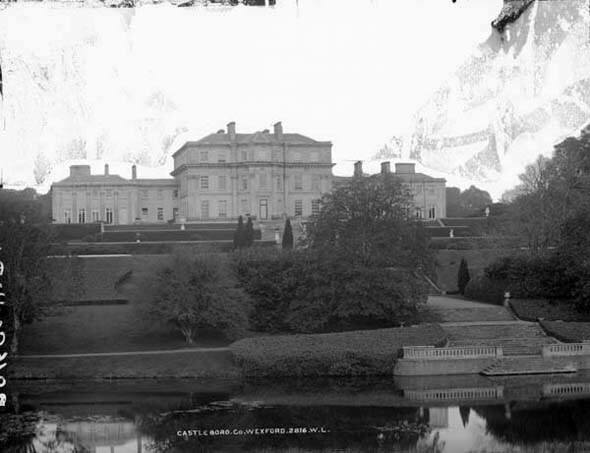 Castleboro was a very large, imposing classical mansion built about 1840 for the 1st Baron Carew. The grand central block of the building presented the appearance of a Venetian Palace, with a frontage of about ninety feet in length. A projecting semi-hexagon bay dominated the garden front about one third of the garden front. The building’s carvings were especially vigorous with a magnificent granite portico supported by six columns of the Corinthian order dominating the entrance. Castleboro was laid out with four stepped terraces, with a manicured grass bank on each side desending to an artificial lake. In the centre of the third bank stood a magnificent fountain flanked by two smaller fountains with pools on the immediate upper terrace. The terraces were only second in grandeur to Powerscourt in Ireland. 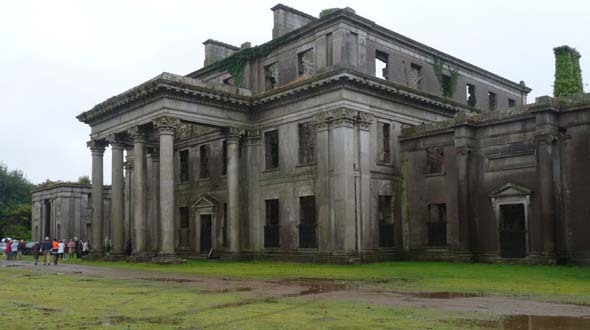 During the Irish Troubles of the 1920s, the Carews sold off the prize cattle heards and furniture and effects and lived full time in England leaving the house locked up. In February 1923, it was torched by a group of armed men and destroyed. It is now a very impressive ruin.